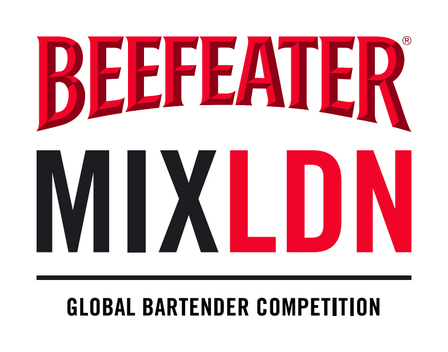 Beefeater Gin proudly asserts itself as the “only historic dry gin still distilled in London” and so London was the obvious city for the fourth Grand Final of its annual bartending competition ‘Beefeater MIXLDN’. 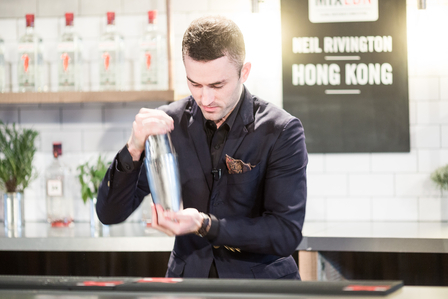 Following three days of competition Brandon Phillips from the USA was pronounced the Beefeater MIXLDN Global Bartender Champion, triumphing over the other 30 finalists from around the world with his 'Hackney Handshake'. The theme of this year's competition was 'London Inspires You. 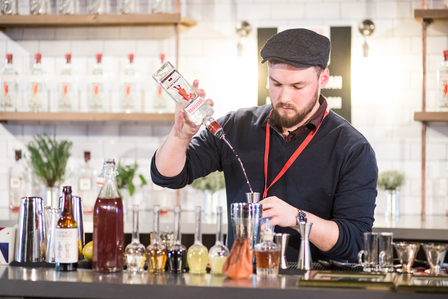 You Inspire London' and with this in mind the competitors were challenged to present their signature cocktail to a panel of judges comprising: Desmond Payne (Beefeater Master Distiller) Ryan Chetiyawardana (industry expert) and Dave Broom (spirit writer). 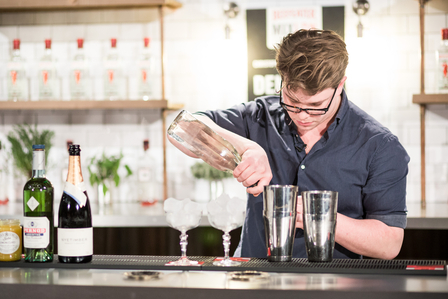 Meanwhile, a couple of floors below in the same building, the bartenders were given 20 minutes and a limited selection of ingredients to create a Beefeater based cocktail to accompany a dish prepared by Luke Rayment, executive chef at Mondrian London. Luke also judged their creation along with Sandrae Lawrence (from Cocktail Lovers) and myself. 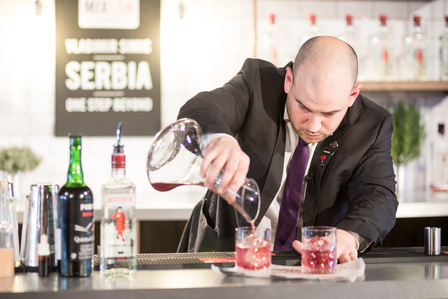 The combined scores of these two challenges resulted in eight overall finalists being selected and tasked with making their cocktail for the guests in attendance at the Grand Final. 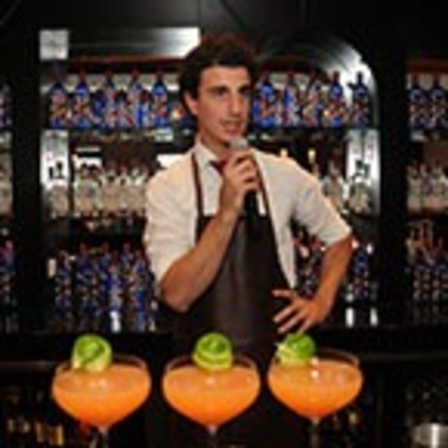 Each guest was then invited to vote for their favourite cocktail with Brandon Phillips creation proving the most popular. 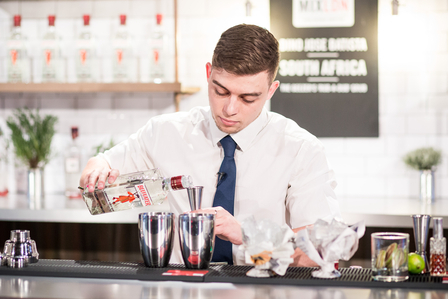 He has won the opportunity to be mentored at the Beefeater Global Brand Ambassador Programme, and will attend two of the world's most prestigious bartender events, which could include Tales of the Cocktail in New Orleans, The Moscow Cocktail Show or Tokyo Bar Show. 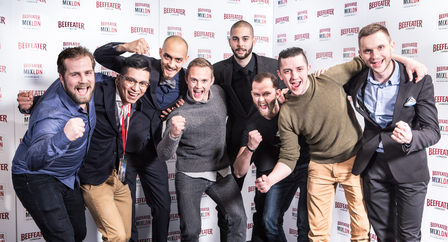 The other seven finalists were Peter Kunz (Austria), Roberto Rossi (Italy), Tomas Melzer (Czech Republic), Santiago Ortiz Jacome (Spain), Truls Thomsen (Norway), Artem Averin (Russia) and Christoffer Nystroem (New Zealand). "In London, you think of red phone boxes, the Queen, the English style embodied by the English gentleman and the taste for a good drink. The after office beer in the pub, the longing for sherry and finally, of course, the British national drink - Gin. 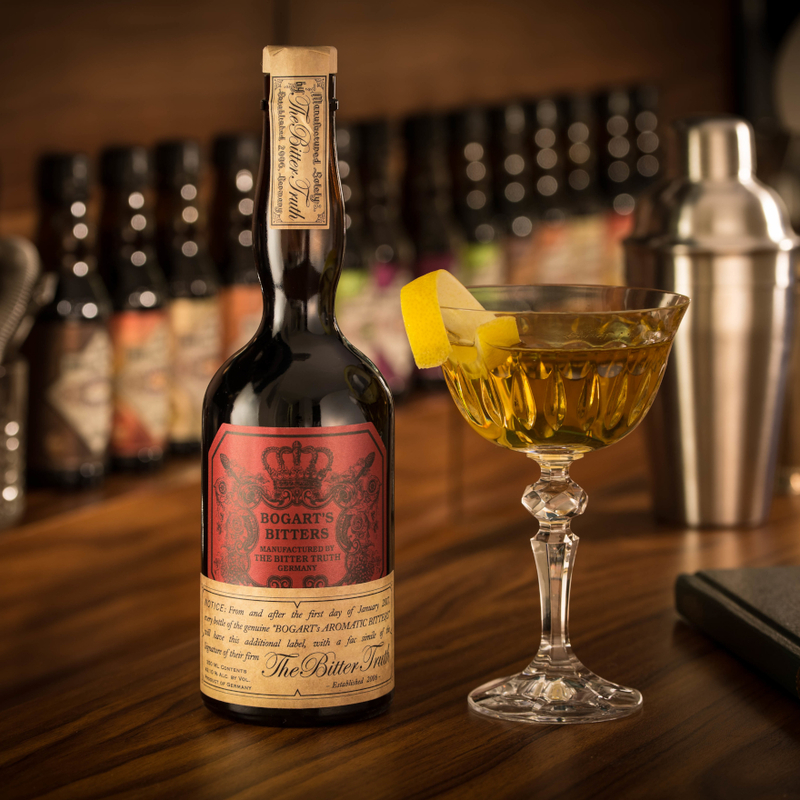 The '24 Gents' opens the door to the second world, a classic drink with an innovative influence. It complements my two favourite drinks; gin and beer with a historical influence. 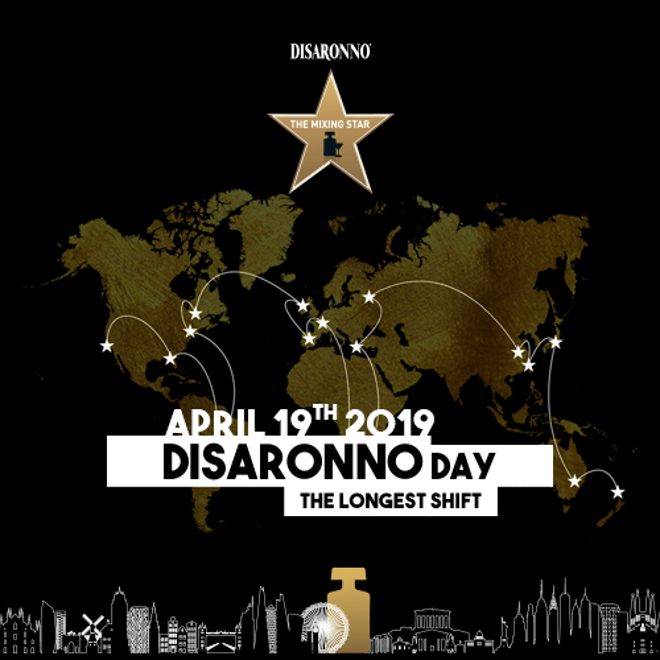 It's a drink for any time of a day." 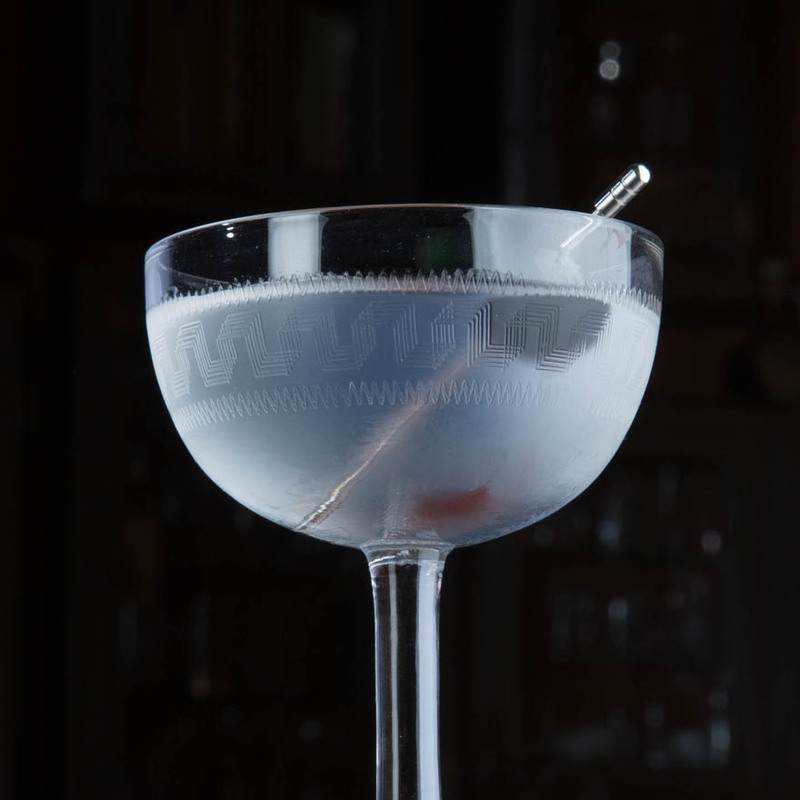 "I twisted a gin fizz trying to use other ingredients that can keep the structure of the cocktail but modify the final result. I tried to look at my competition from 'above the clouds'." 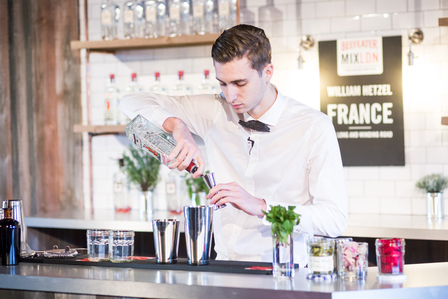 "I was inspired by my last trip to London two years ago - which I won at the Beefeater competition. I had a great day full of typical British activities. It was a rainy day - typical weather for UK. I tried English ale, great black tea and a great curry from an Indian granny in the street. But my favourite part was spent in Zetter Town House. 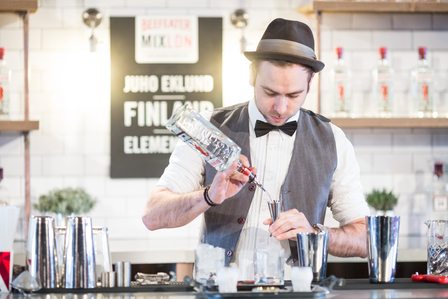 I was so excited about the drinks that I tried." "I was inspired by spring nights." "Paddington bear gave me my first meeting with London. I would wake up and my mom would read a chapter for me before kindergarten. I was eating toast with marmalade, because it was Paddington's favourite, and she was drinking tea. Paddington, being a charming, kind and well educated beer from darkest Peru, is also a playful little bear. A polite bear, always addressing people as Mr or Mrs, and rarely by their first name. Discovered at Paddington station in London by Mr. and Mrs. Brown, they took him in and gave him a home. They promised him Marmalade every day and honey on Sundays. This is a very important part of my childhood, and taught me both to be playful, polite and to try hard to get things right even though you make a mess at first. Making this cocktail, I've made a mess, I've been playful, and I've tried really hard to make it right. Hopefully it would be something Paddington would like." "London is beautiful. I was deeply taken by its grandeur and serenity: the barely visible outline of the Tower Bridge, the raindrops rolling down the old streaky window of the old building. What can be better than a hot ginger drink to warm you up on a rainy day and the scent of grass after the rain? Having put these two things together Alchemy composition was created as a toll to the natural philosophy. I would like to present this cocktail as a pyramid: the top tones are provided by the ginger liquor with its fiery energy and hot temper, a colour palette of citrus tones with a mere hint of sweetness will constitute the base. 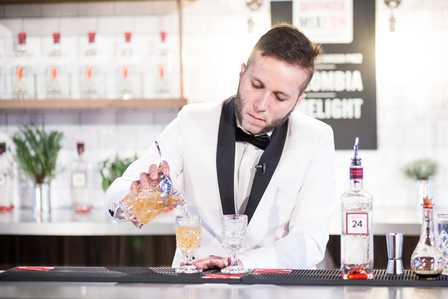 Beefeater gin, with its dryness and easy-going character is the heart of the composition, every drop of this iconic beverage cuts through the past and the present with its subtle edges, setting the tone and the overall mood of the composition. The main perfumery theme is heard in herbal Becherovka chords, that is the very element that gives as the after the rain feeling. A good shake will put all of these colours together into a single composition... And then, as a final touch, I add a few drops of sparkling wine, the little bubbles so reminiscent of raindrops. Now, once the picture is complete, the only thing left to do is to add the little window glasses with a few blades of grass, the garnish as subtle, as Beefeater gin itself. The spirit of London is expressed by the rain falling on the city since the day it was founded until now. With much of the city changed from the days bygone until now, it is only the rain that remains witness of all the splendour and grandeur. This drink serves as a clear expression of the spirit of London in this composition, seen through a little glass with raindrops applied with a few brushstrokes and a few blades of grass in contrast. 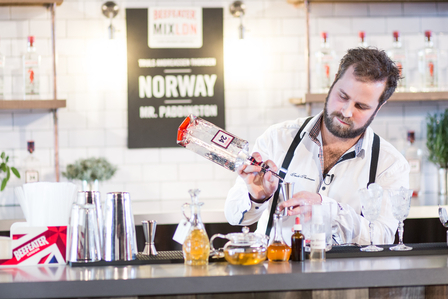 Beefeater, London and Alchemy create sensations that cannot be found in nature." Garnish with cumquat and cinnamon. 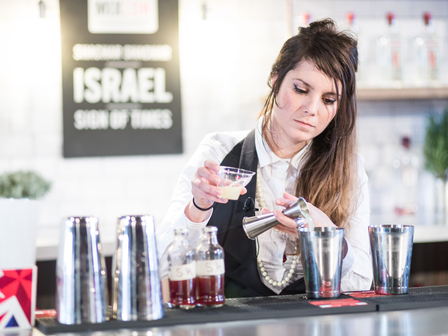 "This drink is an ode to the hipsters of Hackney. A drink that you've just found out about, but they've been enjoying since long before it was 'cool'. So, even though you like their older stuff so much better, throw the new Arcade Fire album on your vintage turntable, sit back and dip your moustache in this delightful tipple!" First six items and chocolate built in whip cream canister and charged twice, left to rest for 2 minutes then strained into cocktail shaker. Egg white added, dry shaken, ice added and shaken vigorously. Double strained into coupe. Garnish: Parallel leaves of cilantro with two drops of Peychaud's Bitters in centre dragging a straw through bitters to stylise. "Gin, cocktails, nightclubs, music and fashion. These are things that make up London to me. I would like to focus on the fashionable aspect of drinking cocktails. You know the feeling of getting dressed up, ready to take on the world, in your favourite outfit. Maybe you like to wear a jacket. Since you're wearing your best suit, why not have a cocktail to go with it. You have a dry martini. Elegant, delicious. Next you want something refreshing but still sophisticated. You stick to gin, sherry seems appropriate. Maybe some herbal notes to compliment the gin. Zesty lemon and pleasantly bitter grapefruit ties the knot. The drink is shaken ice cold and presented in a neat glass. 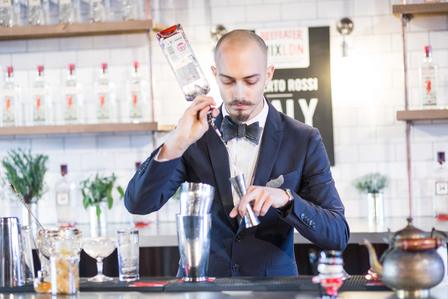 The whole drink comes together as if made to measure. You immediately think of the tailors on Savile Row. A bespoke cocktail to fit your needs. You name the cocktail The Savile Row." Gently swirl coriander around the glass, discard and garnish with red currant on a skewer. 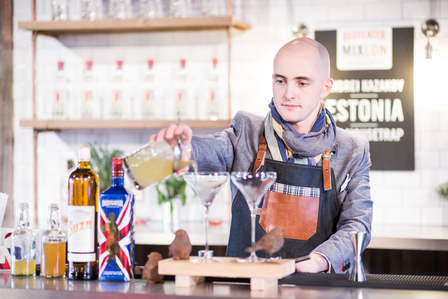 "My Inspiration for this drink came from my background in this industry. 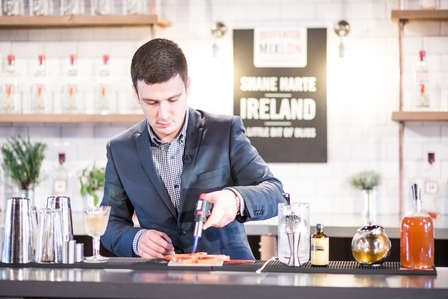 I worked for over two years at the Merchant hotel in Belfast where I was the head bartender for over one year and at my time at that bar working with a menu of over 150 classic drinks I came fanatical about the history of drinks and this industry. One of the stories from London that I had always liked was Beer Street and Gin Lane. The gin craze that was being portrayed as bringing London to its Knees and Beer Street being the City's saviour. Without this London obsession with gin and the Gin act 1751 would London Dry exist as we know it? So part of my inspiration for this drink was the idea of combining Beer Street and Gin Lane in a single expression of London. 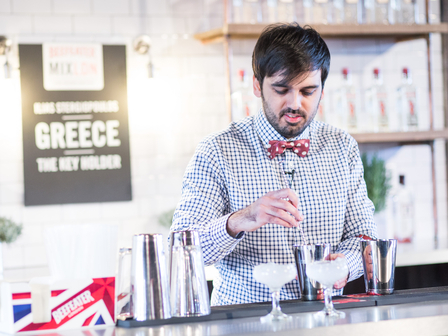 The second part of my inspiration came from the infamous symbol of Beefeater London dry. The Yeomen being of common birth but serving a much higher and noble calling. I wanted to try and create a drink that would suit a Yeomen of the Guard. 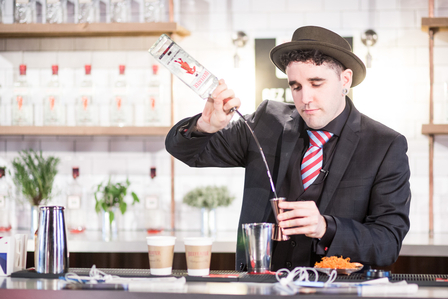 Using three ingredients all created in London being London dry gin, porter and Earl Grey Tea. 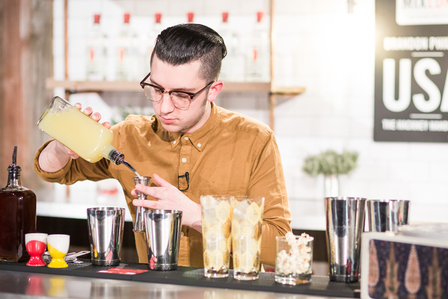 The method of making this drink is the English art of Punch. 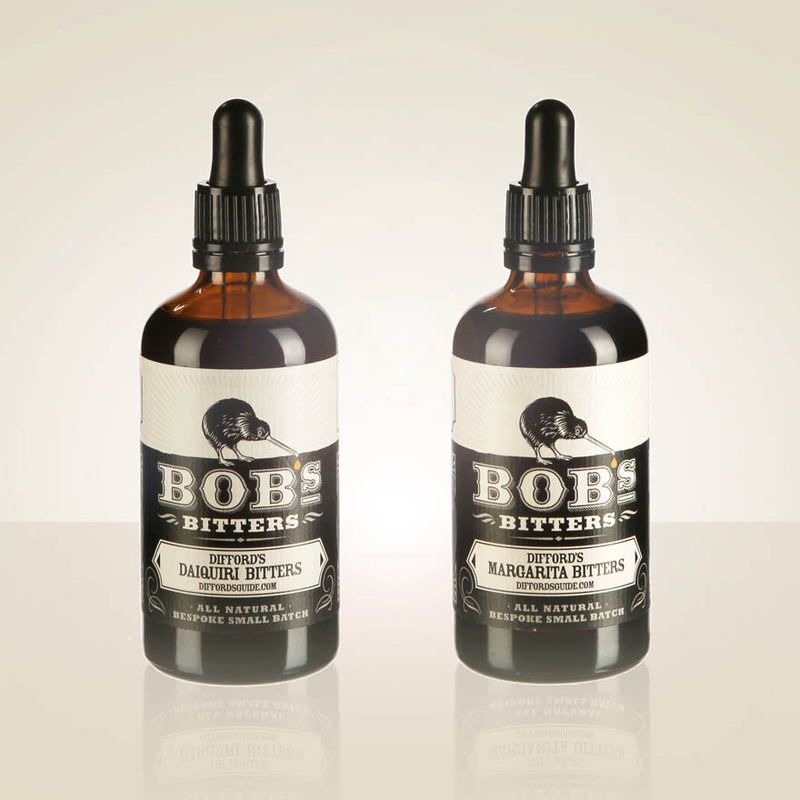 1800 century ingredients using an 18th Century method." 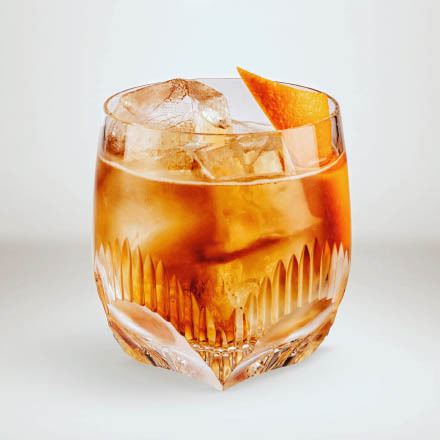 "This drink is inspired by Grub Street (later named, Milton Street), the hackney journalists, political satirists and the derelict coffee-houses in which they inhabited. True to its name, Grub Street housed only the most common and impoverished folk, who's only barely affordable vice was gin. Beer was king in old London, epitomised most shockingly in William Hogarth's twin pieces, 'Gin Lane' and 'Beer Street'. Alexander Pope, author of the 'Grub Street Journal' also wrote extensively on the scourge of drink, harlots and ill-informed hackney journalists. These works, amongst others, helped change public thinking about spirits, ushering in a drastic change to gin distillation practices. 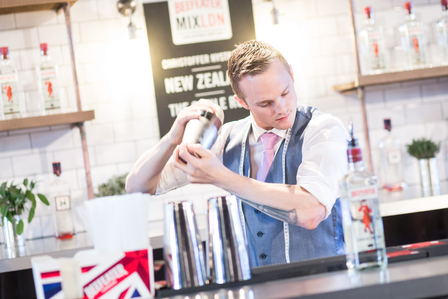 Today, gin sits deservedly amongst the world's most exceptional spirits, and none more so than Beefeater 24. 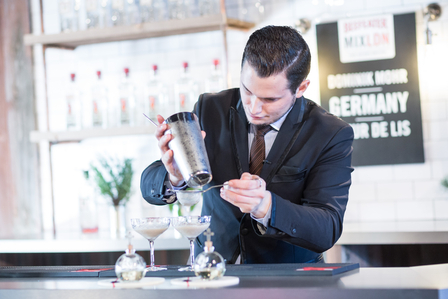 This drink marries Beefeater 24 with white crème de cacao and a light porter cream. The cocktail is finished with an almond praline dust and burnt coffee bean. 'Gin Lane' and 'Beer Street' revisited, with a salute to the vitriolic coffee-house pamphlets that started it all." "My inspiration comes from the primary mode of transport that true Londoners use. The city of London is an inspiration in itself, bursting with talented people all with the common trait of the pursuit of their dreams. The tube is often the time when those dreams take place. The drink is a spin on a London Fog (created in Vancouver and is in honour of pre-7am commutes on the tube - where daydreaming is encouraged and epiphanies are shaped into ideas that change the world." Aromatics of a watercress, sage, cilantro hydrosol. "It's an analogy between my life, the cocktail and the life of the best artist at that time: Charlie Chaplin. My inspiration is based on the most famous movie called 'Limelights' and on the early stages of Charlie Chaplin as an artist in London. The taverns were places of entertainment/amusement where the theatre mattered. The plot of the movie takes place in London during World War I. 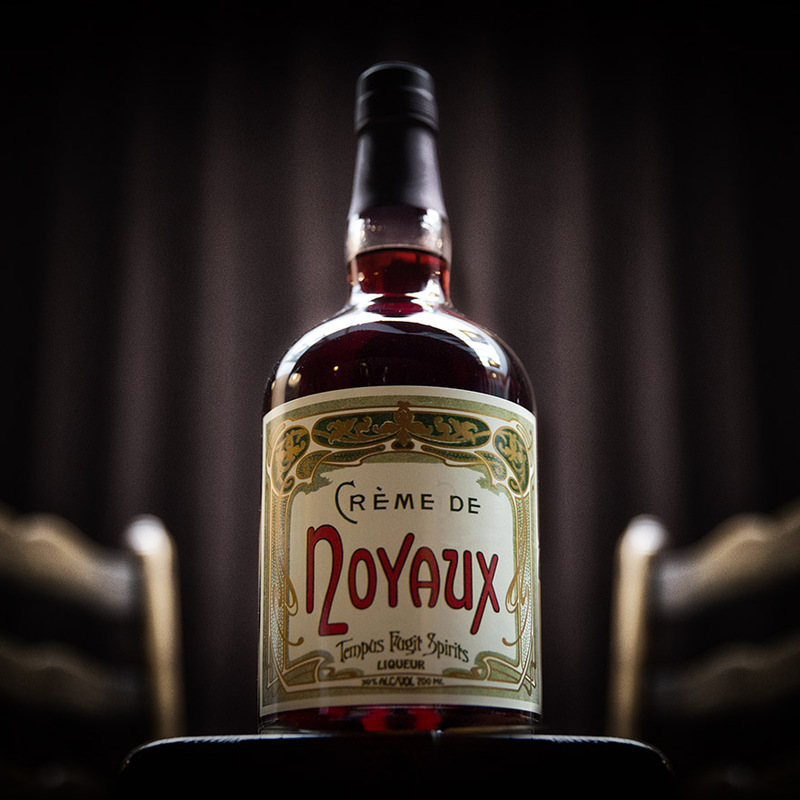 This film is autobiographic, filled with great symbolism and a perfect screenplay/script just like the flavours of my cocktail. 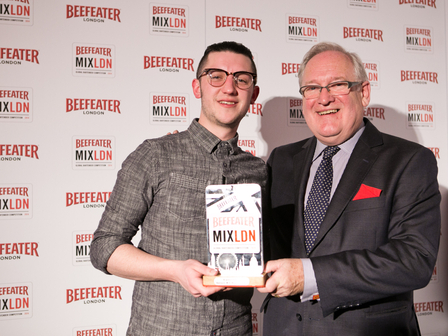 Those flavours help to enhance and understand the tonalities/shades of the best gin in the world: Beefeater." 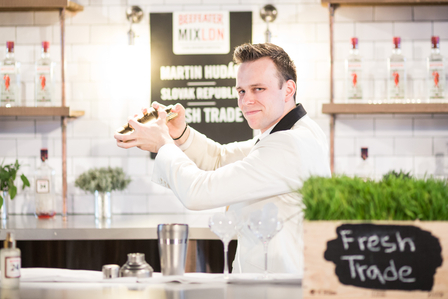 Macerate grapes with lemon juice, then add St Germain, Beefeater, basil leaves and ice and shake and double strain. Serve into cocktail glass. 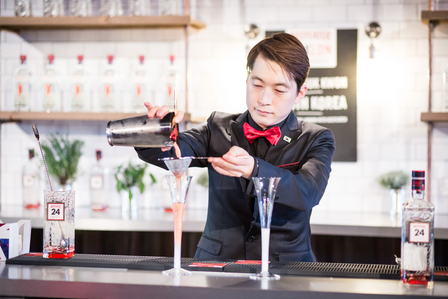 "The Tower of London definitely inspired me when preparing my cocktail, not only for its architectural beauty or being a historical symbol in British culture, but also because it is closely related to Beefeater gin, sponsor of this event. It´s officially Her Majesty´s Royal Palace and fortress and a historical castle located north of the River Thames. It was founded in 1066 as part of the Norman Conquest and it was used as a prison although it wasn´t the first purpose. This place has represented an outstanding role in British history. Nowadays, it´s basically a tourist attraction where the Crown Jewels, a royal armours collection and the Roman Wall ruins are shown to people. The Tower has been guarded by the Beefeaters since 1485 and at the present time, they work as tourist guides being themselves the main attraction. Each afternoon the warders take part in the Keys ceremony which keeps The Tower safe during the night. According to an old superstition, if someday the six crows that remain in The Tower disappeared it would fall down and with it the monarchy. The Tower was declared Humanity´s Patrimony by the UNESCO." "My main inspiration came from my current working place and walking through the multicultural city of London, including the massive fruit markets. Madam Chu's is a cocktail bar situated in the centre of Copenhagen and draws inspiration from Asia. 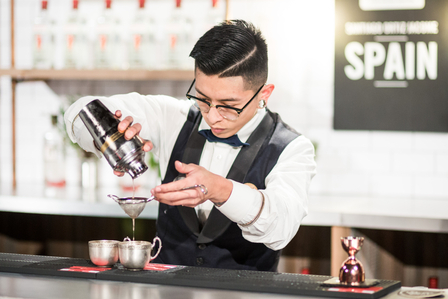 Basically taking classic cocktails and giving them an Asian twist. I have done likewise with the classic cocktail 'Corpse Reviver #2' from Harry Craddock's 'Savoy Cocktail Book' and given it an Asian/British twist. Having spent some time in London I found it to be a city of many cultures including Asia. 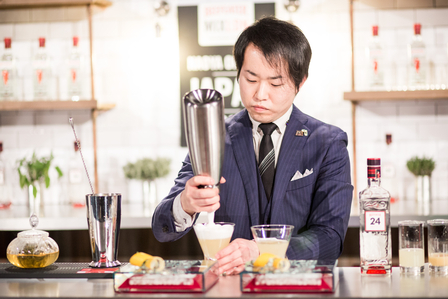 Taking that into the concept combined with the ingredients used to make Beefeater Gin, which contains many spices and herbs from Asia and all over the globe, I came up with a classical cocktail twist including kumquats from Asia and lemon curd from England." "Curiously, for me London is quite a distant and unreachable destination. I am definitely the child of nature, so big cities frighten me in some case. But how does this city inspire me even if I have been there for couple of short time periods? It happened while reading Agatha Christie's fantastic compositions with descriptions and circumscribing's about the details, atmosphere and feeling on the city streets. While reading, feeling that you have been walking down these streets and squares, and been a part of all this, never leaves you. 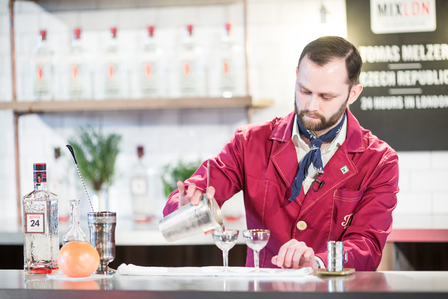 There is a lot of history, city legends, tales, mysteries and speculations on the streets of London and this is an inexhaustible source of inspiration for creative citizens like bartenders for example." "For me, London has always been a slightly mysterious city. A city with a magnificent history in real life and in fiction. My childhood love for suspense started, in my opinion the greatest Londoner in fiction, with Sherlock Holmes. When visiting London, I always tend to recreate scenes from the books of A.C. Doyle in the back of my head and think what the Victorian London would have smelled and felt like to experience. Especially in Baker Street you can feel the presence of mysteries and suspense. That's why I entered the competition, to pay tribute to my controversial but ever so lovable private detective. I wanted to create a smooth, mysterious, slightly herbal cocktail that gets its inspiration from the life of Sherlock Holmes. With this in mind, I shall present to you the 'Elementary." Garnish with lemon and lime zest and a blackberry. 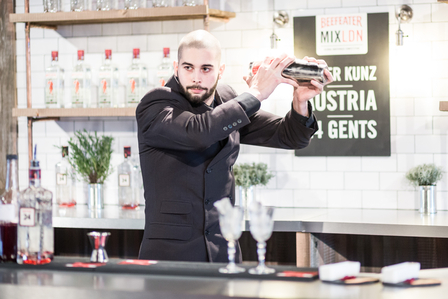 "London is a city that always inspire bartenders. When I think about London, a lot of things come to my mind. Music, English gardens full of roses and pubs. That's why I wanted to recreate a cocktail that mixes everything. One of the most popular drinks that Londoners drink during summer in the park is the Pimms Cup. My cocktail is a variation of Pimm's cup, but stronger with a touch of rose. Don't worry, it is still very refreshing with the Indian Pale Ale, from the micro-brewery The Kernel, based in London. The name of my cocktail is the title of a Beatles song. One of the most beautiful songs they made. Every time I listen to it, I can easily imagine the streets of London, peaceful, cold and windy. One of the most representative songs of London, I think. "London - what's my inspiration to London? Easy answer! I only was once upon a time in London, during the 8th grade for a student exchange. My memories of this trip are Dr. Pepper - so sweet and vanilla and the Queen with the Crown Jewels - so royal and typically English. For my drink I try to bring all the influences in, on a liquid way. Typical English means for me for sure, gin on the one hand and on the other hand some tea time with some After Eight chocolates. So I take milk which I infused with Polo peppermint drops and vanilla. To bring the sweetness and some more typical tea time aromas I cook a syrup which is based on rock sugar. And at the end, to make it real royal, (although the gin is inside), top it with some champagne. Hope you enjoy the other way of an English tea time with the Queen!!" "My inspiration is based in private gardens in some neighbourhoods of London. The first thing that comes to mind when I think 'garden' - is roses and the second is fruit - that's why I choose these ingredients for my cocktail. 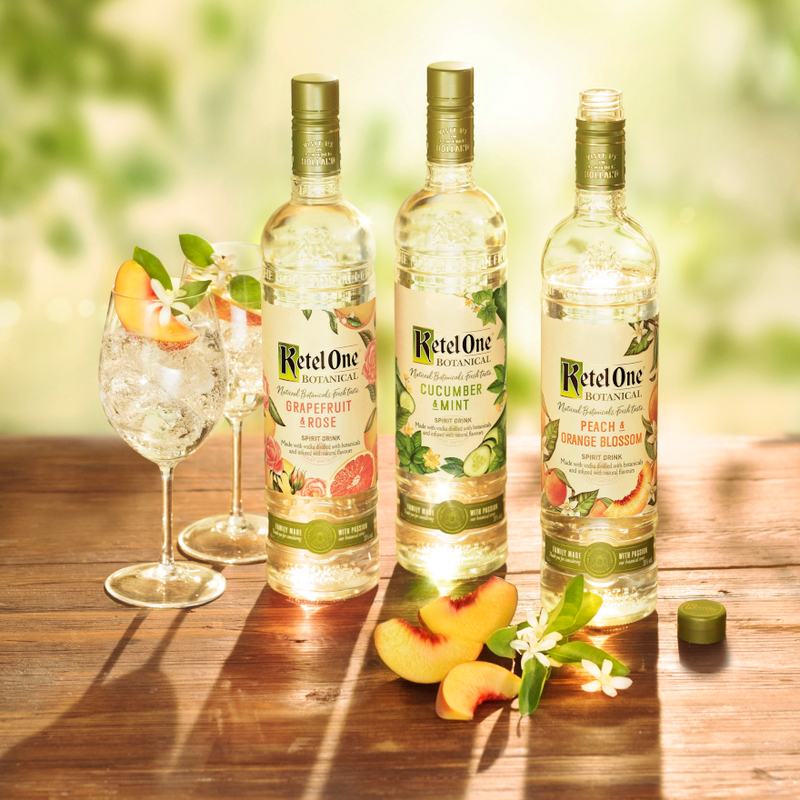 Lemon and fresh ripe pineapple chunks (pureed) blends work harmoniously with the dry and citrus character of Beefeater London Dry Gin with a depth and tangy finish which derived from kirsch and rose powder! Rose powder: add some dried roses in a blender and blend until it becomes powder." "I was actually lucky enough to grow up in London and as such have taken my inspiration from my childhood home, Harrow on the Hill. I've always loved Harrow's feel of a little bit of rural England in London. When I was a kid growing up in Harrow I remember every Sunday morning my mum taking me to the fruit and veg stalls in Harrow Weald. Each Sunday we'd buy a large bunch of grapefruits that my mum would try and feed us for breakfast. I remember hating its bitterness at the time and having to cover it in sugar to eat it. To this day the fresh, zesty and bitter taste of grapefruit that I now love always remind me of those childhood summer mornings in Harrow on the Hill." Stir over ice with star anise. Express lemon oils over top. "Mention 'London' and 'afternoon tea' springs to mind. Enjoying tea is also an activity shared in both Eastern and Western cultures. Now I hear in London there are several speak-easy style tearooms and places that serve specialty cocktails springing up. I was inspired by the tradition of afternoon tea, which is becoming more diverse with the passing of time, and married this with cocktail culture. 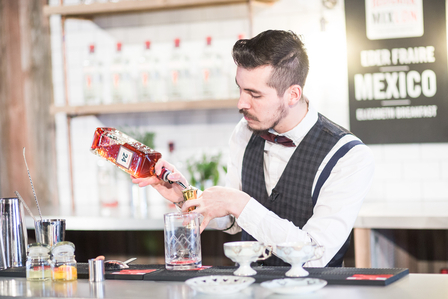 While it bears the guise of tradition, the tea expressed in only Beefeater 24 also infuses an oriental element that delivering a new generational gin - please enjoy Herbal 24!" "London, music, football, fashion left a mark on my growing up. The cocktail will definitely feel the impact of Fred Perry and laurel wreath, you will feel the impact of Ska music and Madness, you will feel the taste of which gained fame thanks to London. The influence of attitude, accept or lose. 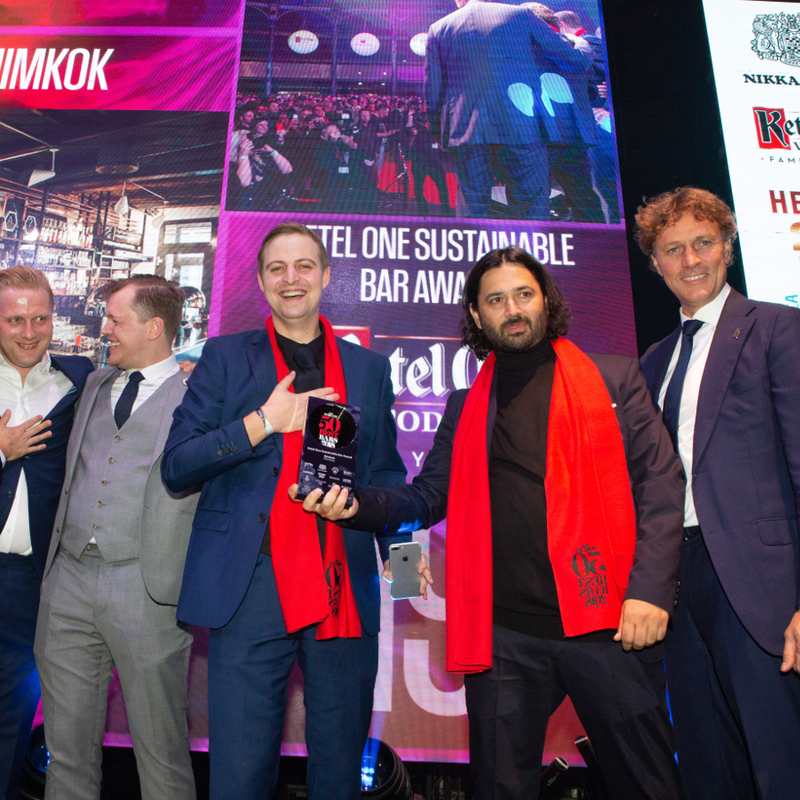 Influence of cocktail culture which is still one step beyond." "Look... Everywhere are some parks and gardens for rest, game, love and work... And also everywhere are some markets for sharing, dealing, tasting and buying crafted goods... Join it together and you will have Burrough's Fresh Trade in the hot Sunday picnic"
"Travelling and working through Europe, one of London's highlights was its great pub ('rub-a-dub' - Cockney Rhyming Slang) lunches. A fan of food in general, mushy peas was the only dish I couldn't really stomach - hence my adaptation of the national favourite side dish in to something more palatable - great for any geyser and his fish and chips!" "I am a fan of Beefeater 24. When I was searching for images related to Beefeater 24, I came across one beautiful poster, which portrayed the midnight view of London with vibrant red colour in the background. Standing inbetween Tower Bridge and London Eye, Beefeater 24 seemed to be in the centre of London, protecting the entire city. As seen in the poster, I remember the beautiful night view of London as well as its reflected view on the Thames River when I visited the city 4 years ago. 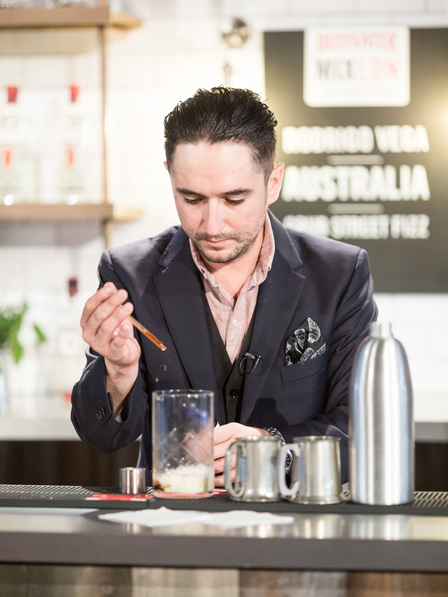 Inspired by this image in my mind, I created this red-coloured cocktail using the gold sugar powder reflecting upon my last visit to London and anticipating my upcoming journey." Garnish with cinnamon stick and grapefruit peel. "There is a huge café culture in Sweden due to the social institution called "Fika", which means having a cup of coffee and a cinnamon bun. I'd like to dedicate my cocktail to the shared purpose of English Afternoon Tea and Swedish "Fika"; ease down, take time to think, enjoy what you are having and the presence of your company. I reckon this kind of date would appear even more pleasant if you switched your coffee or tea for a rowdy drink instead! 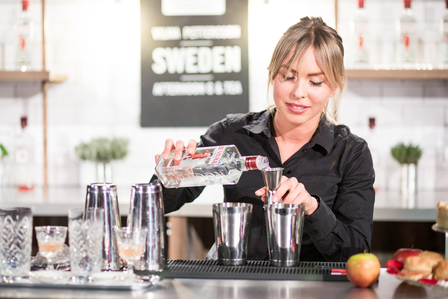 The Afternoon G and Tea Cocktail symbolizes me as a Swedish tourist in London; pausing, eating and drinking my way through the city's diverse and pulsating cultural life." "And they cross the bridge in the morning, my body is their bridge. From the caves of the East to the new East, my body is their bridge. It's an old poem and song which describes how great humans choose to be the bridge for humanity to see, learn and pass into a new understanding of Life. London Bridge, in the capital of the Empire where the sun never sets, is still a standing history which abbreviates dozens and hundreds of years of Blood and Wars, Peace and Prosperity. 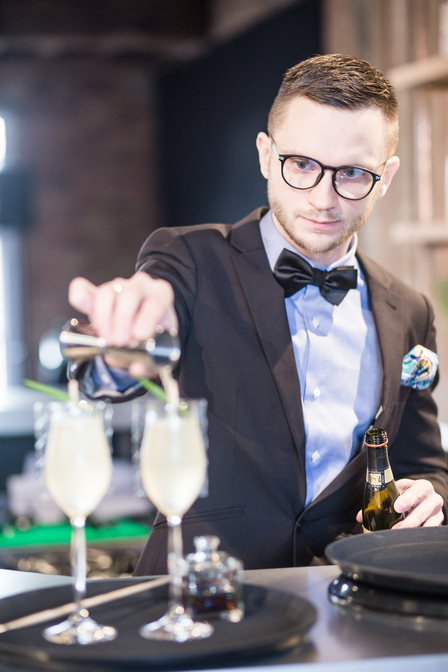 It's the same when it comes to cocktails, an ancient history pop's up, cocktails have taken their role next to great men and women, becoming the new bridges between cultures. Combination of blood orange, Aperol (orange flower), personality of the Beefeater and its ingredients, relating it to the empire-- the orange fruit is always in need for sun to grow." Sadly Fidaa was not able to obtain a visa in time to enable him to travel to London for the final.